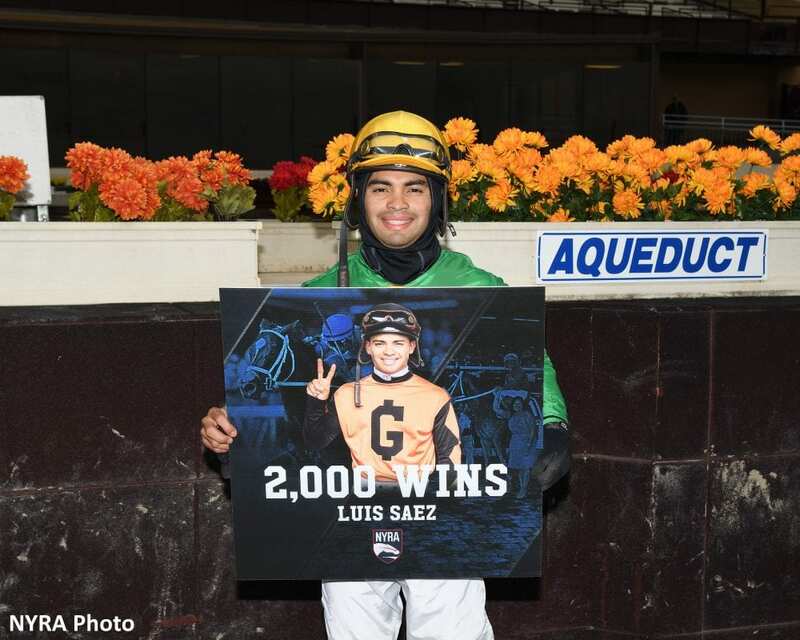 Jockey Luis Saez reached a milestone Friday at Aqueduct Racetrack, notching his 2,000th win in North America when he rode Y'allcomenow (No. 9) to victory in Race 4, a maiden race at one mile on the inner turf. The 26-year-old native of Panama City, Panama earned his first career win in 2009 and has won at least 100 races in every campaign since, including six years of 200 wins, topped by his 281 in 2012. Saez has registered 75 career graded staked stakes wins, including 10 Grade 1 victories. “It was exciting. This is so special. I'm thankful for getting 2,000 wins,” Saez said. “It's not easy. I'm just working hard. When I came to New York, it was hard, but I'm just going to keep trying. Saez was born in Panama City in 1992 and attended the Laffit Pincay, Jr. Jockey Training Academy in Panama. In 2009, Saez began to apply his craft at Calder Race Course [now known as Gulfstream Park West], earning his first win aboard Fearless Honor on August 20 of that year. More success followed quickly, as Saez captured his first graded stakes win in the 2010 Grade 3 Tropical Turf Handicap at Gulfstream Park. His first career Grade 2 win came in 2011 aboard Musketier in the W.L. McKnight Handicap at Gulfstream. Just four years after his racing debut, Saez piloted Will Take Charge to a memorable 2013 campaign in which he won the Eclipse Award as Champion 3-year-old. Under Saez's direction, Will Take Charge won the Grade 2 Pennsylvania Derby, the Grade 1 Clark Handicap, and the Saratoga season's main event-the Grade 1 Travers Stakes, which also marked Saez's first Grade 1 victory. He led Will Take Charge to second in the Breeders' Cup Classic that year during the same championships in which he rode runner-up Judy the Beauty in the Breeders' Cup Filly and Mare Sprint. Other notable winners for Saez includes this year's Grade 1 Man O' War with Hi Happy, Promises Fulfilled in the Grade 1 H. Allen Jerkens presented by Runhappy and the Grade 1 Arkansas Derby with Magnum Moon. He also registered his best finish in a Classic, leading Bravazo to a second-place effort in the Preakness this year. This entry was posted in NL List, People and tagged 2000 wins, 2000th win, aqueduct, calder, jockey, laffit pincay jockey training academy, Luis Saez, North America, Panama, Will Take Charge by NYRA Press Office. Bookmark the permalink.